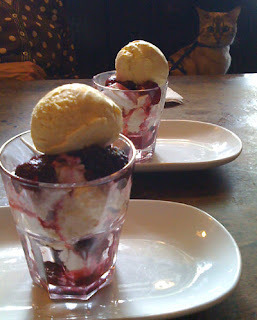 A Blog Of Ice Cream: Ice Cream & Sloe Gin - What A Mess! I love ice cream desserts and it was almost exactly one year ago that I enjoyed one of the best I've ever tasted - Eton Mess, a glorious combination of meringue, forest fruits and vanilla ice cream. The scene of this special ice cream dessert experience was the Windsor Castle pub, one of the most celebrated in central London and a favourite haunt of Old Etonians. It is also happens to be my close friend Mary's favourite place to enjoy a spot of lunch. So when visiting her again just last week, there was no doubt in my mind where she would suggest we went at midday! 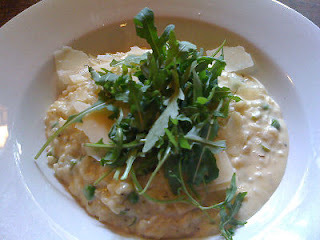 For main course we both selected the asparagus and green pea risotto with fresh parmesan which you can see in the photograph - delicious! "What shall we have for dessert?" came the question. There was no competition ... Eton Mess! This time, however, there was a difference. It had an added little 'kick' .... sloe gin. What a combination! What's more I think it even appealed to Chloe, Mary's cat, who accompanied us to the pub. Look carefully at the top right hand corner of the picture! "Oh hello Chloe!" said the young lady serving us, reaching out to stroke her as we studied the day's menu. Chloe is indeed a very special cat .... a Bengal with beautiful markings that make her look like a miniature tiger and stunning bright blue eyes, she is also a fully qualified Pets As Therapy cat who does great work within the local community. No wonder she's a welcome regular at the Windsor Castle!